Habitat: Dense conifer forests, adjacent meadows, bogs. Generally prefers mix of dense forest and open areas. Diet: Mostly small mammals, including voles, pocket gophers, mice, shrews, squirrels, and weasels. 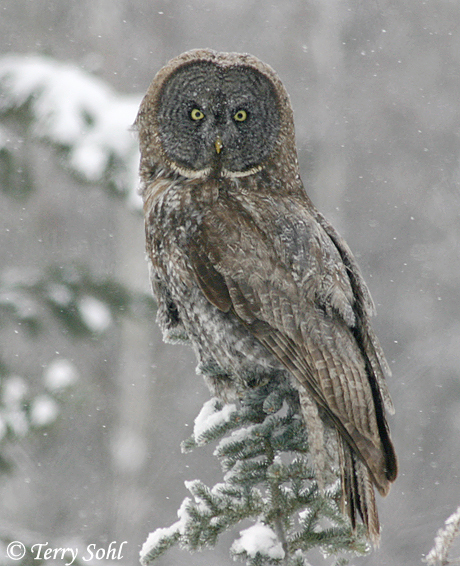 Behavior: Great Gray Owls will hunt both during the day and night, with a significant portion of its foraging occurring near dawn or dusk. They can hunt by either sight or sound. Song: A bold, deep, booming hoo-hoo-hooo; also utters single-note hoots. 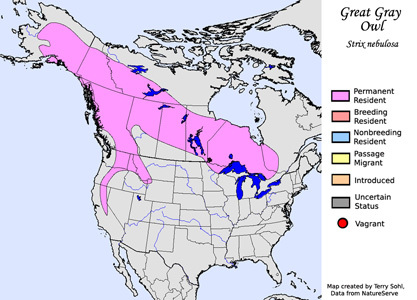 Migration: Permanent resident throughout its normal range in Alaska, Canada, higher elevation areas in the western U.S., and northern Minnesota. However, population crashes of prey mammal species sometimes result in numbers of the birds moving southward in winter in search of food. Similar Species: Generally distinctive, but possibly confused with the Barred Owl. Conservation Status: Possible decline in southern part of its range, but the majority of its range is in areas with little human disturbance. Additional Photos: Click on the image chips or text links below for additional, higher-resolution Great Gray Owl photos. South Dakota Status: Extremely rare winter visitor in South Dakota, with only a handful of records.